Do you ever come off the pitch thinking that you’ve lost a game you should have won – just because of your tactics, or lack of them? 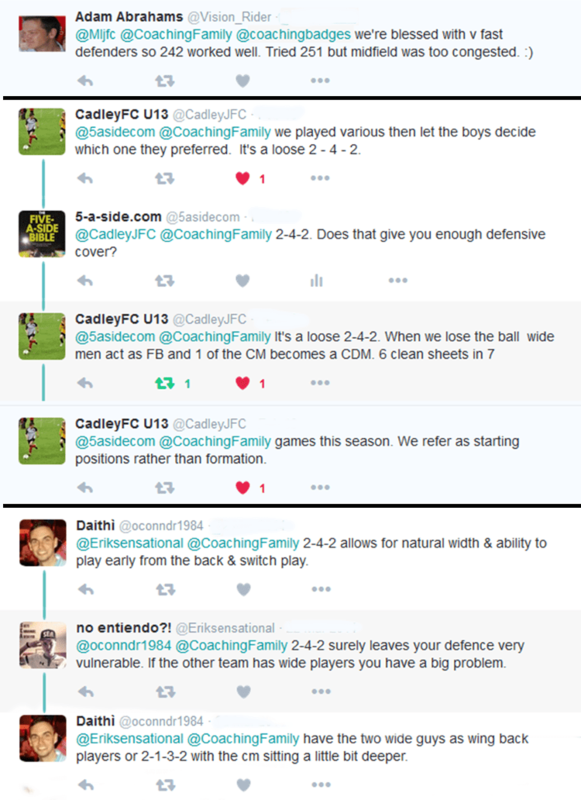 The best 9-a-side tactics can be the difference between your team playing to their potential or floundering badly. The difference between winning and losing. Even just the difference between the team having fun or becoming hopelessly disillusioned. 9-a-side is played widely by kids as they progress through to full 11-a-side soccer. By the time they’re beginning to play 9-a-side, they tend to be developing a reasonable tactical understanding of their own. So it’s important that you provide them with clear ideas, and options for them to explore. As with all forms of football, having good individual players is only part of the formula for success. The other key ingredient is having a clear idea about the way you’re playing; a framework to get the absolute most out of the team as a whole. Let’s look at how you can do that with your 9-a-side tactics. If you want to see this guide in a video format, see the following. Otherwise, just carry on reading below. Things work best when there is a natural balance to the team. If your 8 outfield players all think they are attackers then you’re going to have major difficulty beating any decent opposition. It’s the same if all 8 of your players are doing nothing but defending. Your aim should be to achieve enough balance between attack and defense, as well as between the left and right sides of your chosen formation. I wish I could give you one single formation that will work for every team. Sadly, that doesn’t exist because each team is made up of different individuals and you need to find a way of playing that showcases their unique talents. Maybe your side has a couple of players who possess a lot of pace – you might consider a formation that utilises them as wingers. Maybe you’ve got two excellent strikers that can form an effective partnership – your challenge might be to arrange a team to best support them. There’s no right or wrong answer when it comes to formations. In a lot of cases it will be worth trying a couple of different systems before landing on the one or two that work best for your group. Just remember, whether you’re a group of adults or coaching this to a bunch of kids, systems take time and patience to develop. So don’t necessarily expect instant success. In this formation the width comes from the full-backs who are crucial to the success of this strategy. It’s hard work for the two of them, but allows lots of players to get forward when attacking. Having 4 in midfield could be either a masterstroke, or a burden. One thing is for sure, this allows a great deal of flexibility, and if your players are tactically aware, this could be a great option for you. + Provides natural width from 2 wide players. – Requires two strong defenders who can organise support from the midfield when needed. A more defensive alternative to the 2-4-2. With three at the back this provides a solid foundation to build forward from. Although you might view this as more of a defensive solution, it can easily be adapted into a more attacking 3-2-3 by pushing the wingers forward. Granted, this one is quite different, but it was still suggested by several youth coaches. The chances are that your 9 players are not going to move around the pitch the whole time in the above set formations. Players will get dragged out of position, need to help cover other areas of the pitch, and may find it useful to adopt different positions when attacking to add the element of surprise. So don’t make your formations too inflexible. In a small-sided formation, it’s often more sensible to talk about using at least two different tactics. Don’t over complicate this, especially if you’re working with kids (no 13 year old is going to want a vast playbook of tactics). Try to limit yourself to talking about two simple shapes: one that you use when defending and another for attacking. Try a couple of different formations so that they can find out which one they like best, and most importantly learn valuable lessons from different ways of playing. Don’t get too hung up on formations and don’t restrict kids imaginations. Don’t just think about your formations, think about your players. It should be about how you can best cater your tactics to them. Consider rotating players between positions throughout the season. Players can gain valuable experience by learning to play across a number of different positions. 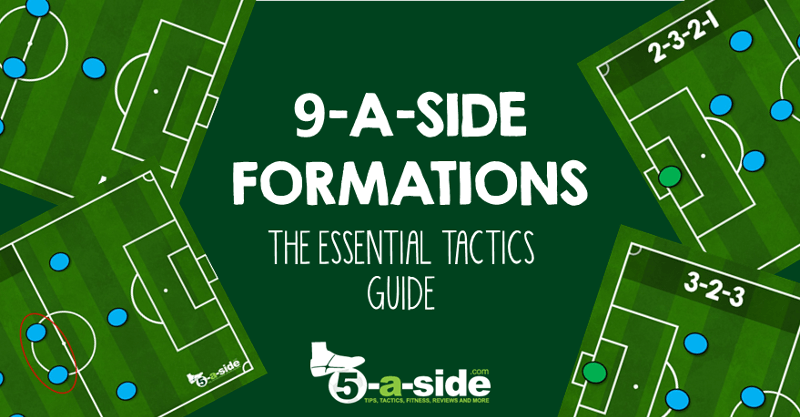 9-a-side has a lot of possibilities over how to set up your formation and tactics. There’s no one single solution. 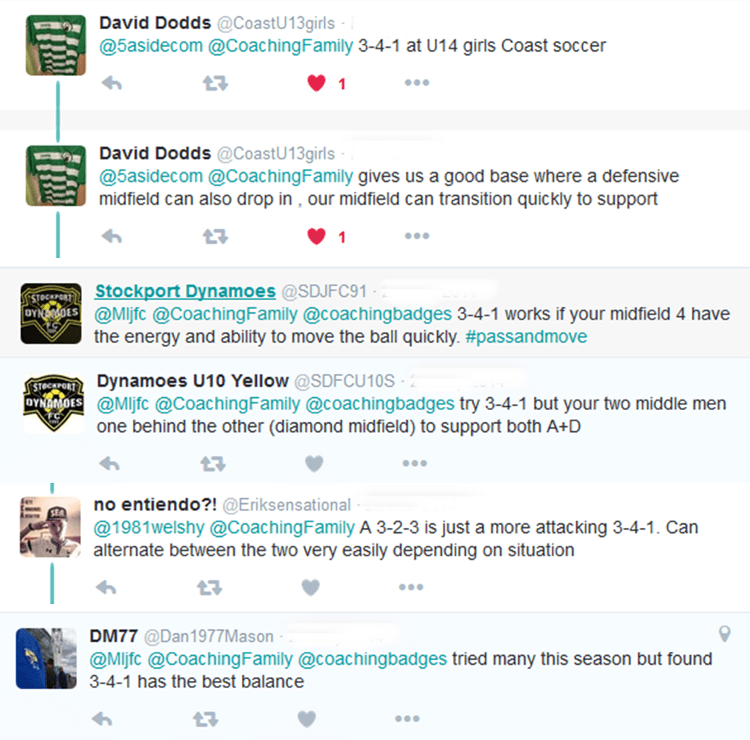 Each team is likely to have their own specific needs depending on the abilities and understanding of the players. Getting things exactly right is going to take a lot of trial and error, as well as patience, but the benefits should quickly show when your team finally understand the system. We play 2-1-4-1. 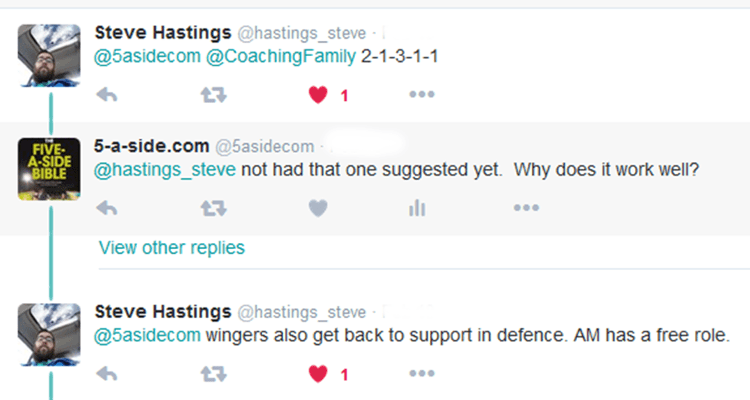 Started off with 3-3-2 which was defensively solid but found we weren’t dominating the middle. 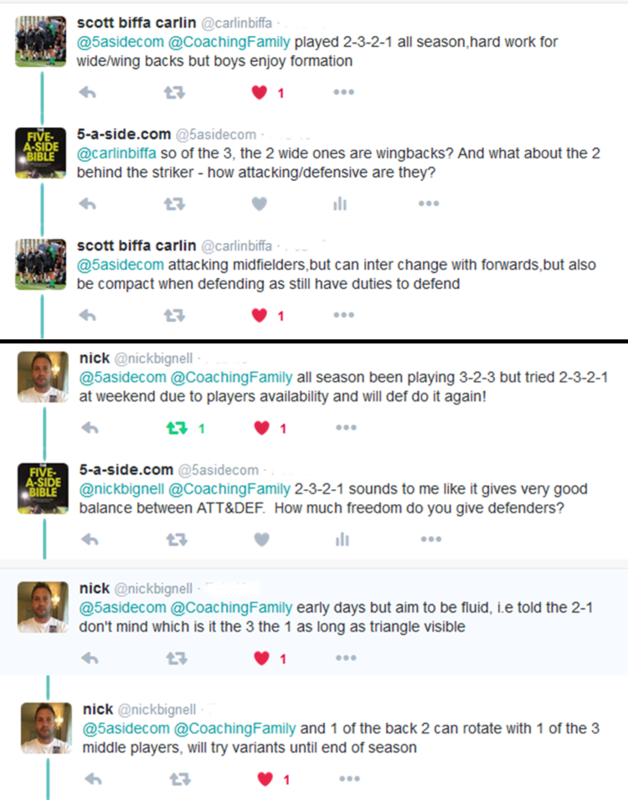 If you have the player(s) to play DM and two complementing DFs (pace/strength) you can counter most oppositions formations. Having one central forward can be isolating so we’ve given the license for our two CMs to break forward to support knowing the DM is the insurance. Will be fun adapting to 11-a-side next season. My U10 is going to age up in the summer to U11 and 9v9. No question in my mind we’ll go with 4-3-1. My main problem is almost always that my more forward-oriented players push up too high and don’t come back. We played 7v7 all year without a striker. 4v4+3 and this pass-in shape drill (https://soccer.coachaide.com/shared/play/4145a73a-a34e-4440-b864-dd49bb701a2b) has helped quite a bit to teach them how to stay in shape and move as a unit. hello my name is Ruben and just reading the main page , i just want to say … beautiful !!!! simple , efective , and easy to share .. thank you !!! and i got your site , for acccident , but what a … “” good “” accident “” once more thanks a million . have a great day !!!! Cheers Reuben. Thanks for the compliment.